Sebastian Vettel admitted Red Bull's unreliable KERS system almost cost him victory in Malaysia - but what is causing the problems and how can they be solved? With their low-running front wing and one of the most efficient exhaust-fed diffuser layouts on the grid, Red Bull appear to have developed the best car at least for the start of this season - but as their rivals copy to catch up, their fundamental failure on KERS development is starting to become a serious worry. McLaren's rapid turn-around from their pre-season disasters to become contenders for pole and race victory in Malaysia has been helped by their decision to drop the 'octopus' exhaust and mimic the approach used by Red Bull. The close competition between McLaren and Red Bull in qualifying last Saturday showed that with all elements working, at Sepang at least, they are fairly well-matched. Red Bull, in contrast, has one major focus - going all-out to fix their KERS problems. But Sepang showed it won't be easy. 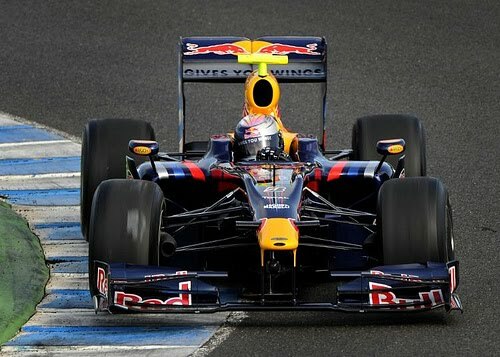 Webber's KERS problem in Malaysia happened on his way to the grid and its immediate failure suggests a software glitch. Vettel's problems started part way through the race, when he was told not to use the system, but apparently after a while he was allowed to put it back on again. Newey explained later this was due to "safety" issues, and the fact it could be restarted after a while may suggest the unit was overheating and simply had to have time to cool down. Certainly, Newey's comments after the race point to multiple issues with the system, not just one clear problem. The Red Bull KERS is based on the Renault and Magneti Marelli system, which was first developed in 2009. The team ran tests with the system back then, but quickly chose not to use it as they concluded the benefits did not overcome the performance loss from the weight increase that came with it. With that weight increase now accounted for in the rules, KERS has all the benefits with none of the side effects in this area - making it an essential system to have on the car. It was confirmed by Renault during winter testing that both Lotus Renault and Red Bull Racing are using an evolution of their 2009 KERS - but, crucially, Rob White explained that "while Renault provides a central point of contact for the KERS system on the engine, its integration into each car and its operation is the responsibility of the respective teams". The electronics and software elements of the system are understood to not be part of the package - suggesting Red Bull has the hardware but must develop their own way of making it work. Newey admitted in Malaysia that the team is struggling due to a lack of knowledge and resources in this area compared to some of the teams with closer connections to automotive manufacturers like McLaren (with Mercedes), Mercedes GP, Ferrari and Lotus Renault. Red Bull's own collaboration with Nissan's luxury brand Infinity is still far too new to net any technical benefits - meaning they are going it alone to find a solution. In addition to the hinted-at software issues, Red Bull could well have other problems in terms of the system's packaging in the car - because technical director Newey is notorious for wanting to limit anything that interferes with aerodynamic perfection. Red Bull's system has the KERS control unit located tight in on the right hand side of the car, with the battery pack tucked onto the side of the gearbox on the left hand side of the car, in an area that would normally be 'dead space' within the sidepod. This contrasts with the other KERS users, who position the batteries beneath the fuel tank. This would normally give a better weight distribution, but due to the new tyres this year, front-to-rear weight distribution has been fixed by the teams so Red Bull can get away with the more rearward location while gaining a packaging benefit - but the question is does its position cause other problems? Both parts of the KERS system get extremely hot during operation and need cooling - but with the more rearward location of the batteries a more complex cooling solution may be required. In addition to this, Newey will be keen to keep cooling inlets as small as possible because any opening in the bodywork causes additional drag on the car. It seems that possible compromises in this area may have gone too far - and any quick fix to increase cooling will harm the car's performance. The unit provides an extra 80bhp for five seconds per lap, providing around 0.3s of lap time advantage, but in terms of out-and-out performance this can obviously be overcome by simply producing a car that is at least 0.3s faster than the opposition when running without KERS - which in Australia is where Red Bull appeared to be. On many of the tracks where KERS is less important, that could still be the situation and if Red Bull's advantage becomes more marginal and they cannot trust KERS they could benefit from removing it and positioning the replacement ballast in locations that will improve the balance and performance overall. But if they did remove KERS, with no testing allowed away from the grands prix they would then have no way of working towards a reliable system - and while they could test on Fridays and then run the 'serious' part of the weekend with ballast instead, it is difficult to make that change quickly. Also, in circuits with longer straights like Malaysia and this coming weekend's race in China, it is the strategic advantage of the KERS system (when used for overtaking rather than just as a tool to provide additional power through the lap) that makes not having it a huge disadvantage. It was clear from Mark Webber's start in Malaysia that a lack of KERS on the start line will ruin a race and his fightback through the field also demonstrated that that without KERS, the movable rear wing (DRS) is less effective too. He managed to use the system for a few moves, but it was not as easy as it could have been. Most importantly for Red Bull, last weekend's race showed that they have the ability to monitor issues with the system and turn it off without a problem if reliability becomes a concern. So it appears the solution, for China at least, is to continue running it while accepting that they may again just have to do a bit of damage limitation if things go wrong.